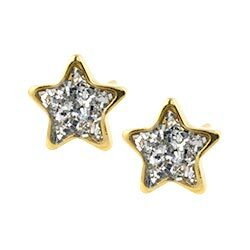 Studex Sensitive hypoallergenic 24 carat gold plated surgical steel 6.5mm star stud earrings with resin covered glitter centres. These earrings come with matching butterfly backs. Really sparkly and a lovely size. Looks very pretty with the gold surrounding it. Love these earrings they are very pretty and just the right size. My daughter chose these from the website because they are so unique...she loves the shining stars. 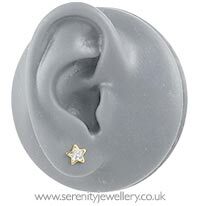 They look beautiful on her also, ideal for sensitive ears. Love these, they are really cute! The posts are shorter than others I have from studex (even tiny tips) but still fit my adult ears.